Doctor John H. Watson is one of the great overshadowed characters of literature (for others, see Jim in The Adventures of Huckleberry Finn and Nausikaa in The Odyssey; there are many). Sherlock Holmes is not being ironic when, in “A Scandal in Bohemia,” he says, “I’m lost without my Boswell.” He would not only have been lost to current recognition and to posterity, but in his own self-absorption and ego. In this blog, however, I’m not writing about Holmes, but about his companion, who, in the story “Shiva’s Eye,” encounters mysteries long before he ever encountered his famous friend. Moreover, we must admit it’s because of Doctor Watson’s writing that his friend became famous. “Shiva’s Eye” can be read as a prequel to the Sherlock Holmes canon. Watson tells us in the beginning of his narration of the first Holmes novella, A Study in Scarlet, that the Afghan campaign in which he participated brought him “nothing but misfortune and disaster . . . I served at the fatal battle of Maiwand. There I was struck on the shoulder [in later stories we also find he was wounded in the leg] by a Jezail bullet, which shattered the bone and grazed the subclavian artery.” After he had “rallied” at the base hospital at Peshawar, he “was struck down by enteric fever [typhoid], that curse of our Indian possessions.” The battle of Maiwand was a major and unexpected defeat for the British in the second Anglo-Afghan war. Watson tells us that his “nerves are shaken,” and when he meets Holmes, the detective’s first words to him are, “You have been in Afghanistan, I perceive.” “Shiva’s Eye” sees this campaign, its disastrous outcome, and its seeming supernatural mysteries unfold through Watson’s eyes. These stories come from a collection of fourteen that I’m working on to be called Adventures Without Sherlock. There have been countless spin-offs of Sherlock Holmes in print and in film, but none that I know of which only features Dr. Watson, without the help of his illustrious friend. I’ve endeavored to stay true to the narrative voice of the Sir Arthur Conan Doyle stories, but mine develop the doctor’s character much further, covering the range of Watson’s adult life: from a failed romance in the Highlands that resurfaces in the gold country of California (the latter refers to an unpublished play by Doyle in which Watson ventures to the Wild West); to his participation in the Afghan campaign; to his years with Holmes when he was on his own—either on holiday or shortly after his first wife’s death, and then Holmes’s presumed death; to his later years when he visits Ireland on the verge of Civil War; or a trip to Berlin in 1933, when, in his eighties, while being honored by his German publisher, he encounters the beginning of the Nazi terror. We also see Doctor Watson giving a nod to his friend, or perhaps in silent competition with him; for instance, in an early story we find that Watson hunted a demon cat on the craggy fells of the Lake District long before Holmes stalked a hell-hound on the misty moors of Devonshire. A post-World War I story even features Conan Doyle, who, as Watson’s editor and friend, asks the doctor to join him on a search for fairies. So in these stories Watson finally gets his due. Through his presentational immediacy and objective but deeply personal involvement, we feel the presence of a brave, compassionate, and highly moral man. Traditionally, these qualities have been applied to his protagonist, but we must remember that Sherlock Holmes is filtered through the perspective and the values of Doctor Watson. Once we are familiar with Watson as a narrator, we cannot help but think of him, unlike Holmes, as a very human and most likable human being—as that rare thing among writers: a genial personality. Doctor Watson is well overdue to be the hero of his own series. As readers of the Holmes stories, we are aware of the doctor’s keen sense of observation, his fine ear for dialogue, and his pacing to give a sense of suspense and adventure (the last being a quality for which Holmes chided him). We are also aware of Watson’s self-effacing habit of always putting himself in the background; the stories are not about him. In my stories, although Watson is still loath to talk too much about his personal life, we can’t help but see his character more: his self-reflections, doubts, epiphanies, his dedicated persistence in arriving at truth—and we see him growing in his abilities as a detective. In “Shiva’s Eye” we also see him go where the cold reason of Holmes would never venture: into the possibility that there is more to life than the rational mind can understand. With any and all readers keeping in mind that they are following the adventures of Doctor Watson, not of Sherlock Holmes, and therefore may be exposed not to singular analytical reasoning from effects to causes but to a dogged, quotidian effort to get at the truth (or in “Shiva’s Eye” assistance from an unexpected source), I offer these stories to whomever may have a few quiet minutes to spend with the good doctor. USA Today and New York Times bestselling author Rebecca Cantrell is the author of the Joe Tesla thrillers and the Hannah Vogel mysteries, among several other series. Her work has won the Thriller, Macavity, and Bruce Alexander awards. Here she talks about “Homework,” her story in the current July/August issue of AHMM. 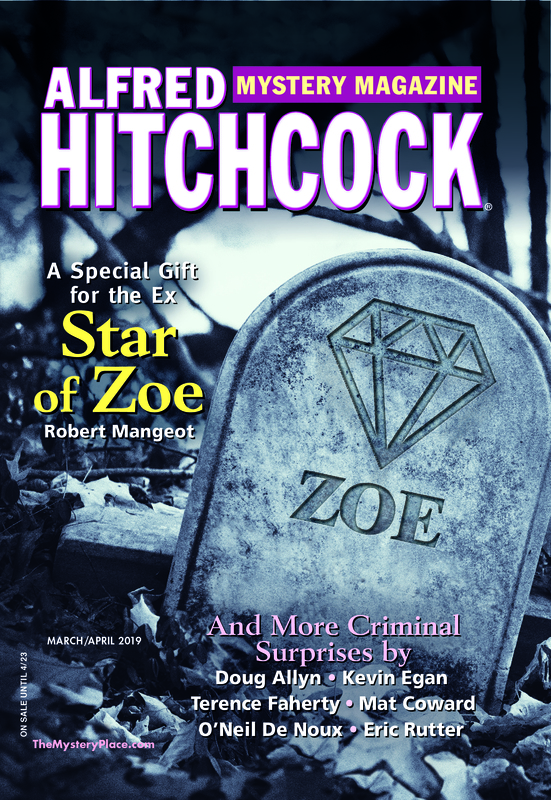 Alfred Hitchcock’s Mystery Magazine requested a piece about writing heist stories, presumably because I have one in this month’s magazine. Or maybe they’ve discovered my plans for Fort Knox. I’m going to play it straight and pretend it’s about writing. No spoilers. So, here’s the skinny. A good heist takes planning. Everyone needs to know their role. Character expertise is crucial. The execution needs to be solid. And a little misdirection doesn’t hurt either. Those are the elements of a heist, and a short story isn’t so different. First, I had to figure out what to steal. The story started with a writing prompt from my teenaged son. The first line had to be “Flames licked the ceiling.” Max is a fantastic writer, and I wanted to have fun with his prompt, to write about flames and licking and ceilings and not have a fire. So, it started with the dog, Flames, and her owner, Ada. I followed Flames along, as surprised as she was by how things unfolded. If the story had been a real heist, I’d say that by the end of the first draft I knew what I wanted to steal. Now I knew the crime, but like a good heist, this story took some planning. In the second draft I tightened up the action and descriptions. I made sure every character in the caper was properly trained. Training wasn’t enough though because characters are more than their training. Everyone had secrets, too. I wanted the reader to sense that all wasn’t quite well, but still be surprised at the ending. I slipped in shiny little nuggets of misdirection for the reader, for the characters, even for the dog as the heist was executed. As a person, you live life in one direction, today gives way to tomorrow. But that’s not true for a writer. As a writer, you can go back and forth in a story like a crazy person with a time machine, changing the future and the past. Nobody knows if it took one draft or twenty. This is handy in writing, and I imagine it would be useful in pulling of a heist, too. Luckily, writers have some advantages over thieves. They get one chance. The last thing to arrive was the title. I wanted a title that didn’t make sense until the very last line. It slipped into my head like that ring slipped on Ada’s finger. Then, hopefully, the meaning of the title and the aftermath of the heist became clear. Or maybe you’re just left with a dog and a handful of . . . pumpkin pie. Last week, the Dell mystery fiction editors were proud to be featured in short interviews over at SleuthSayers. Today, we have the pleasure and honor of welcoming a SleuthSayer to Trace Evidence. New Jersey author Thomas Pluck is the author of Bad Boy Boogie, a Jay Desmarteaux crime thriller, and the short-story collection Life During Wartime—among other titles. He was also the editor of Protectors 2: Heroes, which was nominated for an Anthony Award. For growing up in a family that always had one leg outside the law, it took me a long time to fully embrace crime fiction. My first entry was Miss Marple, perhaps surprising for a writer often pegged as noir. I was raised by my grandmother since I was six, so I felt comfortable around a table of old ladies at tea. And as a kid, I didn’t know how crooked we were. The house I grew up in was a marker for a gambling debt, filled every Sunday with bikers, truck drivers, disgraced cops, managers of mob-owned bars, and cocktail waitresses. I didn’t find anyone like my family in the books we read in school, but I did find them in crime fiction. My mom and I traded authors like baseball cards. Have you read this one yet? You’ve got to read this. . . .
Crime fiction is a diverse carnival, from the gritty carnies operating rickety rides to the wholesome side where bakers peddle tasty treats, where murder is more shocking but no less likely. Marks come from the farm or the inner city, all have a place here. When I browse the mystery section or flip through AHMM or EQMM to hear the sweet rasp of the pages, I may find myself in the suburbs of ancient Rome, in a gilded drawing room with a locked door, or in a rough spot in a country where I can’t speak the language but I know the music, because the human heart is the same wherever you go. And that’s why the kid who grew up next to a Superfund site and managed to snag a degree in English Lit writes crime fiction, and is proud to be part of the carnival of crime. Leslie Budewitz is the author of the Spice Shop and Food Lovers’ Village mysteries. She was the first author to win Agatha Awards for both fiction and nonfiction (for Death al Dente and Books, Crooks & Counselors: How to Write Accurately About Criminal Law and Courtroom Procedure). The fifth book in her Food Lovers’ Village mysteries, As the Christmas Cookie Crumbles, is out this week from Midnight Ink. Here she talks about the inspiration for her story “All God’s Sparrows” from the current issue of AHMM. In “All God’s Sparrow’s” (AHMM May/Jume 2018), we meet Mary Fields, a historical figure also known as Stagecoach Mary and Black Mary. Born in slavery in Tennessee in 1832, Mary worked after the Civil War as a domestic servant in Ohio, where she met Ursuline Sister Amadeus Dunne. In 1884, Amadeus—by then the Mother Superior—took a small group of nuns to St. Labre, in Montana Territory, to start a school. The next year, the Jesuits asked her to start a school serving Blackfeet Indian girls and white settlers’ daughters at St. Peter’s Mission near Cascade. In 1885, Amadeus became ill with pneumonia, and Mary traveled west to nurse her. Amadeus recovered, and Mary remained to work at the Mission. Legend says she created more than a bit of trouble, and eventually, the bishop forced Amadeus to fire her. Amadeus helped her get the postal delivery route in Cascade, leading to the nickname “Stagecoach Mary.” Later, she became postmistress, the second woman and first black woman in the country to do so. She was known for her love of baseball, children, and flowers. Mary Fields died in Great Falls, Montana in 1914. I’d long heard of Mary and wanted to write about her, but had no idea what kind of story I could tell. Though literate, she left no written record, although extensive archives at the state historical society and Ursuline Center document the mission and her life. Writing in Montana 1889: Indians, Cowboys, and Miners in the Year of Statehood, historian Ken Egan, Jr., notes that racial and ethnic minorities played a greater role in territorial Montana than one might think from the monolithic appearance of the present-day state. The war displaced many people, white and black; the vast lands of the West beckoned. But as statehood approached, pressures increased. Native peoples were forcibly moved onto reservations. National events, such as the Exclusion Act of 1882, devastated the Chinese community, which had grown up around railroad construction. The lands were harsh, and many early settlers moved on. Mary stayed. Why? Clearly her bond with Amadeus was strong. But difficult as life here was, I think the West gave her a freedom she lacked in Ohio. In the last few years, I’ve fallen in love with historical mysteries. Finally, I realized, I’d found a format that would allow me to explore the life and times of this astonishing woman. I hope you enjoy taking the trip back in time with me. John H. Dirckx is the author of Dr. Thorndyke’s Dilemma (Aspen Press) and short fiction in AHMM, EQMM, and Woman’s World as well as nonfiction in the medical field. Today he talks about handling clues in mystery fiction, and in particular his short story “Go for the Juggler,” the latest in the series featuring Detective Sergeant Dollinger and Lieutenant Auburn, from the current issue of AHMM. A detective story needs a crook, a crime, a sleuth, and one or more clues that enable the sleuth to pin the crime on the crook. Not all clues in mystery fiction, however, point to the identity of the criminal. Some merely help to establish a chronology of events, provide background details, or exonerate suspects. Others are blatant red herrings, designed to bewilder or mislead the detective for a while and, perhaps for a while longer, the reader. Whence does the mystery writer garner clues that meet the requirements of both plausibility and evidential value? Often they turn up in the ongoing series of occurrences, mostly banal, that weave the fabric of daily life: the broken shoestring, the misread headline, the book put back on the wrong shelf in a moment of distraction. In “Go for the Juggler,” Detective Auburn tumbles to the killer’s trick of insulating a car battery terminal with a plastic cap because he had once made the mistake of wiring up a new battery without removing the protective cap placed on the negative terminal by the manufacturer. That idea occurred to me because I once made the same mistake myself. Auburn finds a cache of gold and jewelry by observing that the discoloration on the underside of a kitchen cabinet caused by rising heat doesn’t match the present location of the electric toaster. Over the years I’ve noticed several such discolorations while sprawled on various kitchen floors installing or repairing appliances. Clues mustn’t be too conspicuous or too transparent—otherwise there is little or no mystery. The word kieselguhr has had an intriguing and exotic ring to my ears from the first time I heard it in a chemistry lecture decades ago. Kieselguhr may not be in your working vocabulary, but you can find out more about it than you could possibly want to know with a simple Internet search. “Nor yet the last to lay the old aside.” In the construction of the modern detective story, convention permits an occasional nod to the venerable past of the genre. For the piece of evidence that clinches the guilt of the killer in “Go for the Juggler,” I fell back on that hoary cliché, fingerprints found on articles used in the commission of the crime. Who says tradition isn’t what it used to be?